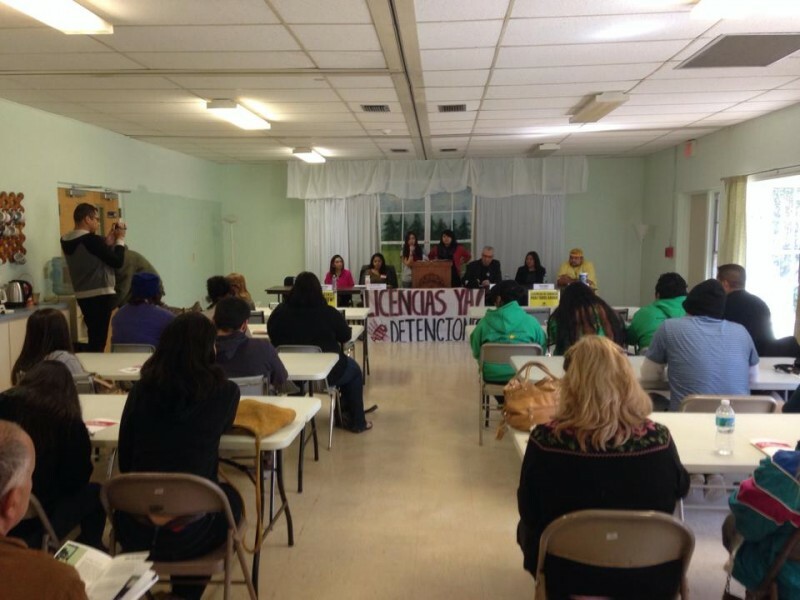 'Stop the Heartbreak' immigrant rights event held in Tampa | Fight Back! Tampa, FL – More than 30 people gathered at the First United Church of Tampa, Feb. 14, for Raíces en Tampa's "Stop the Heartbreak" Comprehensive Immigration Reform (CIR) panel. Some audience members traveled from Gainesville, Auburndale, Clearwater and Lutz to Tampa. Oscar Hernandez of Raíces en Tampa provided transportation to two members of the community who, due to Florida's restrictions on the undocumented, did not have a license or vehicle. Catherine Lim and Catalina Gutierrez, both members of Raíces en Tampa, moderated the panel. Among the panelists were Jaqueline Cruz of Faith in Florida, Cielo Gomez of Casa Chiapas, Daniel Barajas of Young American Dreamers and Civil Rights leader Carlos Montes who traveled from East Los Angeles. Five questions were asked of the panelists - each question was developed and debated for over three weeks among the Raíces en Tampa members. "We wanted to make sure every panelist was able to respond to the best of their ability," said Alicia Gazga of Raíces en Tampa. "The panelists were chosen because of the current work they do and the work they have done in the past." Stirring debate among the panelists, some of the questions were: "What are your opinions on Obama's Executive decision in November 2014 around extending Deferred Action to parents?" and "What are the potential side effects of having a marked license for undocumented immigrants?" To the second question, Daniel Barajas responds, "Marking someone as undocumented reminds me of when Nazi Germany marked the Jewish with the star of David. If we fight for equality, then why are we only getting everything but equality?" One of the most debated questions was how to proceed with the fight for drivers licenses to be issued to the undocumented in the state of Florida. Jaqueline Cruz and Daniel Barajas both agreed Raíces en Tampa's current messaging needed to be modified to add "safer roads" in our list of demands. Currently Raíces en Tampa organizes primarily against deportations and has used the lingo, "licenses are a basic right." Carlos Montes, who comes from the state of California, which just started issuing drivers licenses in January 2015 to the undocumented states, "We are the ones who are fighting for licenses. We as the people either affected or as those organizing must remember why we are fighting for licenses to begin with. The politicians might only see it as a safe roads concern but to the undocumented and their families, the battle is entirely for equality and entirely against deportations." The panel concluded with a fundraiser barbeque in celebration of unity. Raíces en Tampa thanks all who attended and is looking forward to their next rally scheduled against the Tampa City Council on Feb. 26, starting at 6:00 p.m. The facebook event for the rally is here: https://www.facebook.com/events/807926392632953/. Be sure to attend and help continue fighting for equality and a stop to deportations!